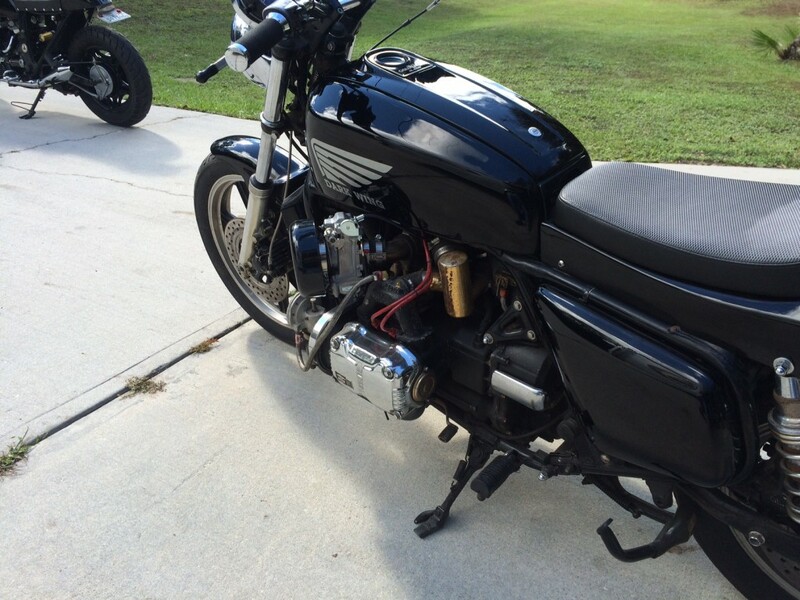 Don’t see this everyday: Goldwing with Ferrari downdraft carbs. 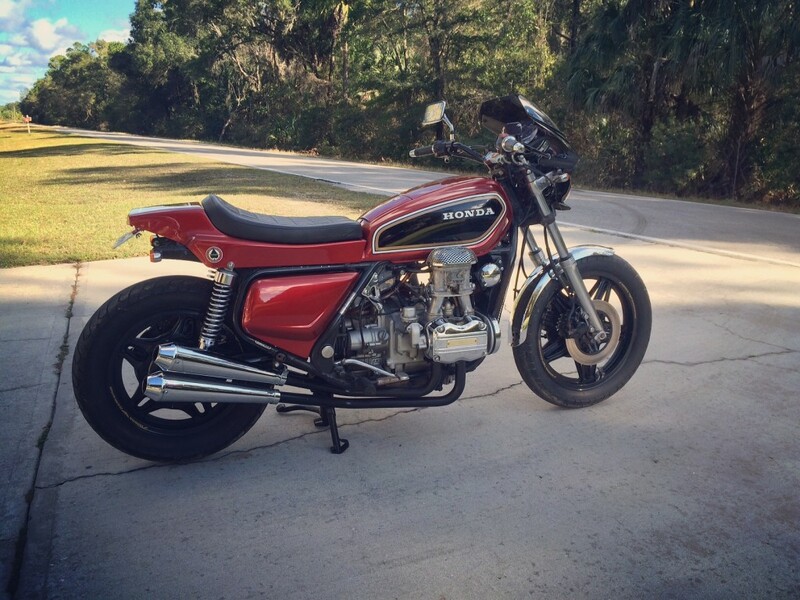 Rick Brown, BikeBound’s senior traveling correspondent, recently rode through the Sunshine State, making in-person pilgrimages to such well-known Florida shops as Dime City Cycles, Steel Bent Customs, and Moto Studio, featuring some of the interesting creations he glimpsed along the way. This is his report from Hotwing Glass, located in Yankeetown, Florida. Not many people turn Gold Wings into café racers, but Dave Burgess of Hotwing Glass does, and we’re happy to be able to feature two of his unique creations. Dave’s business, Hotwing Glass, is well known in the vintage bike community for his seats, exhausts, bars and other parts. The name comes from a friend’s comment that his hot-rodded GLs were so fast they should be called “Hot Wings.” These two bikes certainly fit that description. Dave no longer builds bikes for sale, but rather to showcase his accessories business. The first bike is a 1981 GL1100. 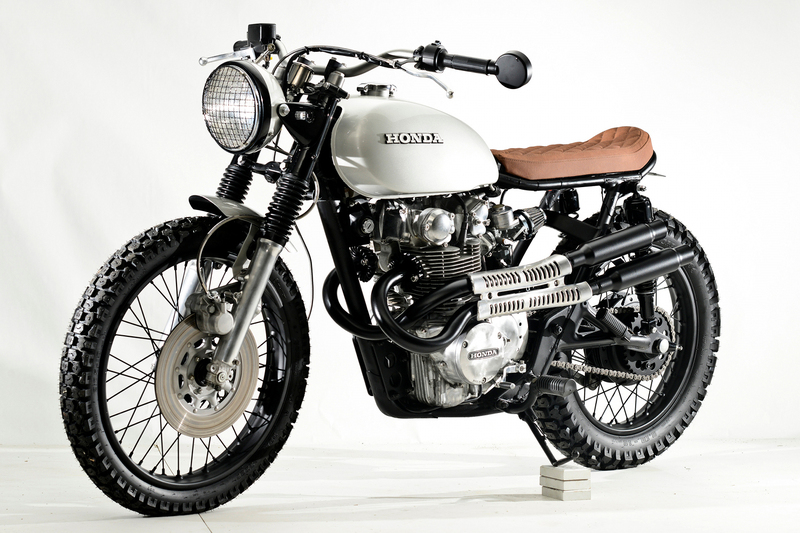 What truly sets this bike apart is the fuel system. The engine is fed by downdraft Weber carbs sourced from a Ferrari, flowing through custom intake manifolds. The seat, bars, rear sets, turn signals, and exhaust are all designed and produced by Dave’s company. The frame, wheels and suspension are basically stock. BikeBound was lucky enough to have the opportunity to ride this machine, and it was a hoot to say the least. The exhaust sounds simply amazing, like a cross between a straight pipe Harley and a small block Chevrolet. Not a bike to ride in the rain, of course. But on sunny days, this bike is a two-wheeled ground-pounder without equal. Turbocharged ’76 GL…this old ‘Wing will MOVE! 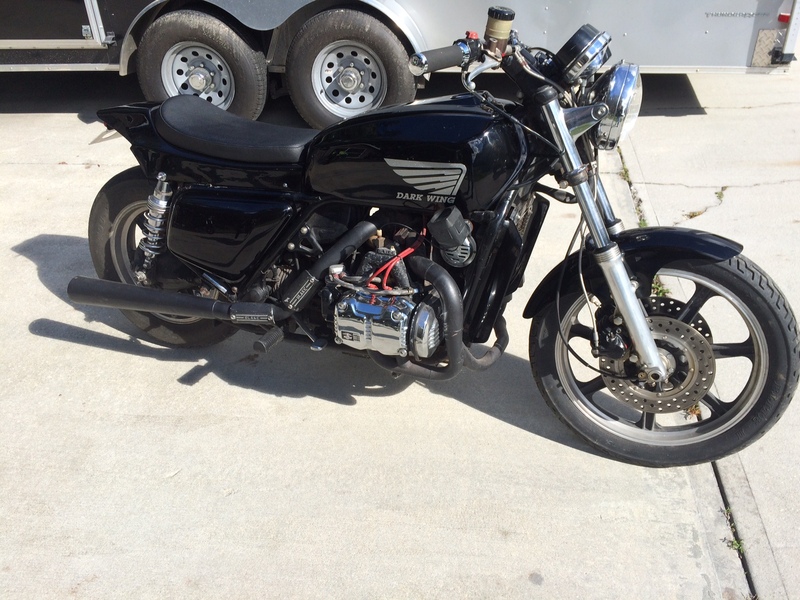 The second bike, “Dark Wing,” sports a turbocharger. The 1976 GL has a complete Blake turbo system including the exhaust, while carburation is handled by a 40 mm flat slide Mikuni. Blake manufactured complete turbo systems for the GLs back in the ‘80s, and they are extremely rare today. The wheels and suspension remain stock but the seat and tail are HG products. Like what you see? Check out Dave’s Dark Wing 1 and Dark Wing 2 seats.